NEW YORK CITY, April 10, 2019 – More than 900 riders from 20 countries descended on the world-famous tourist destination of Punta Cana. 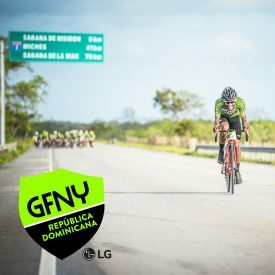 The first granfondo ever held in the Domincan Republic created great impact for local sports tourism. The peloton took full advantage of the tailwind on the fully closed highway during the first 60k, hitting speeds of well above 50km/h. But despite the blistering pace, local elite riders still tried to make a difference and initiated several attacks. The following hilly section with short pitches of over 10% incline and the return to the finish into the fierce Passat headwinds started to diminish the lead group. At the end, a group of 14 riders prevailed. It was an exciting sprint finish for the podium. Top honors were taken by local rider Delvy Capellán Almonte in a time of 3:41:26.5. Fellow countryman Giancarlos Crispín Castillo took second place in 3:41:26.9 and Puerto Rican, Xavier Santana rounded out the podium in 3:21:27. In the ladies race Dominican riders dominated the podium with another sprint finish for first and second place. Juana Fernández Veras edged out Karla Excelsia De Jesus Rodriguez by two hundredths of a second in 3:57:24.2. Maricarmen Saleta completed the podium in 4:16:47. Next up, GFNY Global Cycling Marathon Series heads to Israel on May 3rd for GFNY MIDDLE EAST – AFRICA CHAMPIONSHIP JERUSALEM.